I do like reading chick-lit once in a while.Believe me,good works belonging to this genre are genuine fun reads.These days,there is a brand new desi (wannabe) chick-lit hitting the bookstores every other day! Almost all of them have the same old desperate-oversized girl in the wrong side of twenties-looking for a boy formula but not many of them end up selling more than a few hundred copies! So now,when a new chick-lit work reaches me for review,I think twice before accepting it.This new work by debutant author Shikha,came to me for review a couple of weeks back.Anyways,here I am,reviewing this desi (Mills and Boons inspired) romantic tale! 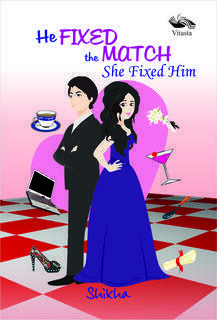 I picked up 'He Fixed the Match,She Fixed Him' by first time author Shikha expecting it to be a quick,fun read.Well,the book turned out to be fun in parts,but again,if you are looking for something new in it,you will definitely be disappointed.It's the same old 'brash boy-marries-goody goody girl-only to fall in love with her in the climax- story,served in a new format! So,'HFTM:SFH' tells the tale of Shreya,an ambitious,highly qualified Dilli girl and Kunal, a young entrepeneur.Kunal tricks Shreya into an arranged marriage and how Shreya fights back and make the crooked Kunal fall in line is what this book is all about.As you might have figured it by now,the plot of this book is wafer thin and what makes it work to some extend is the writer's minty cool approach to her debut work.Shikha has made sure that the tale is peppered with entertaining one liners and interesting incidents though one gets the feeling that there were more of them.A little more imaginative plot with interesting twists might have made this book a far better work. Verdict-On the whole,'He Fixed the match...' is a passable affair.I'm giving it a 2.6 out of 5. Well written review. I shall give this one a pass!